For the better part of a millennium, Europe’s legal systems decided difficult criminal cases in a most peculiar way. When judges were uncertain about an accused criminal’s guilt, they ordered a cauldron of water to be boiled, a ring to be thrown in, and the defendant to plunge in his naked hand and pluck the object out. The defendant’s hand was wrapped in bandages and revisited three days later. If it survived the bubbling cauldron unharmed, the defendant was declared innocent. If it didn’t, he was convicted. These trials were called “ordeals.” They reached their height between the 9th and 13th centuries, and the methods varied. In one variant, a piece of iron was heated until it was red hot. The defendant picked it up and carried it with her bare hand. In another, the defendant was stripped naked, his hands and feet bound, and he was pushed into a pool of holy water. If the defendant sank, he was acquitted. If he floated, he was condemned. Modern observers have roundly condemned ordeals for being cruel and arbitrary. Ordeals seem to reflect everything that was wrong with the Dark Ages. They’re an icon of medieval barbarism and backwardness. But a closer look suggests something very different: The ordeal system worked surprisingly well. It accurately determined who was guilty and who was innocent, sorting genuine criminals from those who had been wrongly accused. Stranger still, the ordeal system suggests that pervasive superstition can be good for society. Medieval legal systems leveraged citizens’ superstitious beliefs through ordeals, making it possible to secure criminal justice where it would have otherwise been impossible to do so. Some superstitions, at least, may evolve and persist for a good reason: They help us accomplish goals we couldn’t otherwise accomplish, or accomplish them more cheaply. Ordeals were based on a medieval superstition called “iudicium Dei” - the judgment of God. According to this belief, God helped man resolve judicial matters through trials of fire and water. The superstitious “logic” that underlay ordeals was based on divine intervention. God, the thinking went, saved innocent defendants from being burned in hot ordeals and allowed guiltless men to sink in water “over which He hath thundered” in cold ones. The ordeal, then, offered a way for God to render judgment. How might these trials have worked, without divine intervention? The key insight is that ordeals weren’t just widely practiced. They were widely believed in. It’s this belief - literally, the fear of God - that could have allowed the ordeals to function effectively. First, consider the reasoning of the defendants. Guilty believers expected God to reveal their guilt by harming them in the ordeal. They anticipated being boiled and convicted. Innocent believers, meanwhile, expected God to protect them in the ordeal. They anticipated escaping unscathed, and being exonerated. The only defendants who would have been willing to go through with the ordeal were therefore the innocent ones. Guilty defendants would have preferred to avoid the ordeal - by confessing their crimes, settling with their accusers, or fleeing the realm. The next thing to understand is that clerics administrated ordeals and adjudged their outcomes - and did so under elaborate sets of rules that gave them wide latitude to manipulate the process. Priests knew that only innocent defendants would be willing to plunge their hands in boiling water. So priests could simply rig trials to exonerate defendants who were willing to go through with the ordeal. The rituals around the ordeals gave them plenty of cover to ensure the water wasn’t boiling, or the iron wasn’t burning, and so on. If rigging failed, a priest could interpret the ordeal’s outcome to exculpate the defendant nonetheless (“His arm is healing well!”). The ordeal system was only as strong as the superstitious belief underlying it. So, over time, as people’s belief that God was behind ordeals weakened, so did ordeals’ power to satisfactorily deal with criminal defendants. One crucially important contributor to this decline was the Catholic Church. In the early 13th century, Pope Innocent III spearheaded a damning denunciation of ordeals on the grounds that ordeals were antithetical to Christian doctrine. His edict banned priests from further involvement with them. The Church’s condemnation of ordeals seriously undermined the superstition on which ordeals relied. If ordeals were antithetical to Christianity, how could God reveal defendants’ guilt or innocence through trials of fire and water? Ordeals disappeared from Europe after Pope Innocent III’s decree. But, while they lasted, they improved criminal justice. Ordeals are inferior to modern trial methods because modern defendants don’t believe in iudicium Dei, not because trial by jury is inherently superior. 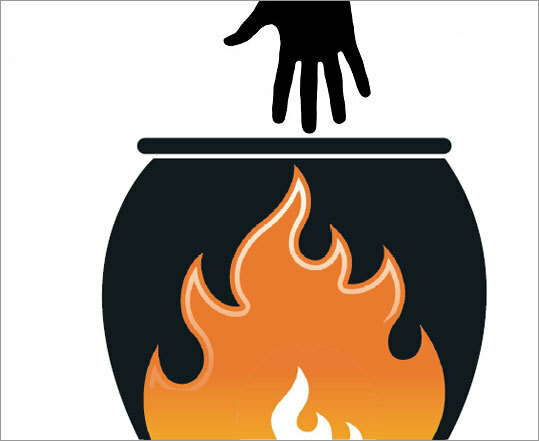 If modern citizens did have the superstitious belief required for ordeals to work, it might make sense to bring back the cauldrons of boiling water. Jury trials are expensive. Ordeals cost something, too. But they don’t require days or weeks of a half dozen or more jurors’ time. Nor do they require lawyers. If the strength of superstitious belief required for ordeals to work as well as trial by jury existed, society could use ordeals to secure the same degree of criminal justice for a fraction of the current system’s cost. Consider the savings society would enjoy if citizens firmly believed that an invisible, omniscient, and omnipotent being would severely punish them and their families, not just in an afterlife, but in this one as well, for cheating, stealing, and dishonesty. In the superstitious society, “irrational” beliefs do part of the work that government institutions of law and order do in the nonsuperstitious one. This insight may help explain the prominence of superstition in some societies. Many societies weren’t, and in some cases still aren’t, wealthy enough to create strong, effective, and more expensive state-made institutions of order. Superstition’s prominence in such societies may reflect the need to rely on cheaper substitutes for such institutions, substitutes such as beliefs in curses, afterlives, and iudicium Dei. If this is right, it’s not only that scientific advance crowds out superstition. As societies become wealthier, superstitions become less necessary. So people abandon them. This creates the space required for scientific understandings to emerge. Still, even the wealthiest societies have room for, and can leverage, superstition. To see this, look no further than the practice of oath swearing in courts in the United States. Oath swearing has an even longer history than ordeals. In ordeals’ heyday, elaborate forms of oath taking, sometimes taken with others called “compurgators,” were often the first resort for judicial questions. Oath swearing survives today. No doubt part of the reason for this is that the superstition underlying its ability to promote justice has survived, too. Historically, oaths were sworn on the Bible, or other holy books, to God. For people who believe God frowns on lying, oath swearing can be a powerful force encouraging truthful testimony. In 1961 the US Supreme Court upheld individuals’ right to testify in court without swearing an oath. But it remains common to ask people providing testimony to do so, or at least to promise to tell the truth. While the explicit invocation of God is all but gone from modern oaths, the solemnity of the oath itself remains strong. Previous researchers have found evidence that certain superstitious beliefs may be socially productive in modern societies. Important work by Robert Barro and Rachel McCleary of Harvard University, for example, finds that stronger beliefs in an afterlife are associated with higher economic growth. Similarly, in a recent experimental study, Azim Shariff and Ara Norenzayan of the University of British Columbia find that when “God concepts” are activated in the minds of experiment participants, they’re more cooperative with one another. One of the potential reasons for this result, Shariff and Norenzayan point out, is that individuals may be more likely to behave in socially positive ways when they feel that God is watching them. Of course, not all superstitious beliefs are socially productive. Besides encouraging criminals to reveal themselves and witnesses to tell the truth, superstition can create conflict and inhibit economic activities that create wealth. Especially if it’s hard to hold productive superstitions separately from unproductive ones, superstition might retard rather than promote social progress. Still, it’s useful to bear in mind that many bizarre and seemingly irrational beliefs emerged for a reason and, at one time, served a socially useful purpose. Even modern superstitions aren’t all bad. Some may actually make us better off. Now, where did that cauldron go? Peter T. Leeson is visiting professor of economics at the University of Chicago’s Becker Center on Chicago Price Theory, author of the paper ”Ordeals,” and author of the recent book ”The Invisible Hook: The Hidden Economics of Pirates” (Princeton University Press, 2009).